Bought my first cast iron skillet. Thread: Bought my first cast iron skillet. Can't believe after almost 50 years of growing up in Idaho and camping and hunting that I've never owned my own cast iron cookware. My grandparents had them. My folks have them. My brother has them. I never did. But yesterday I was at Walmart and saw the two types of cast iron cookware they had; the Lodgepole and the very cheap Chinese stuff for half the price. I bought a Lodgepole skillet for $20, which I thought was reasonable for something that was obviously much thicker and better designed than the $10 Chinese version. So now I'm seasoning it. 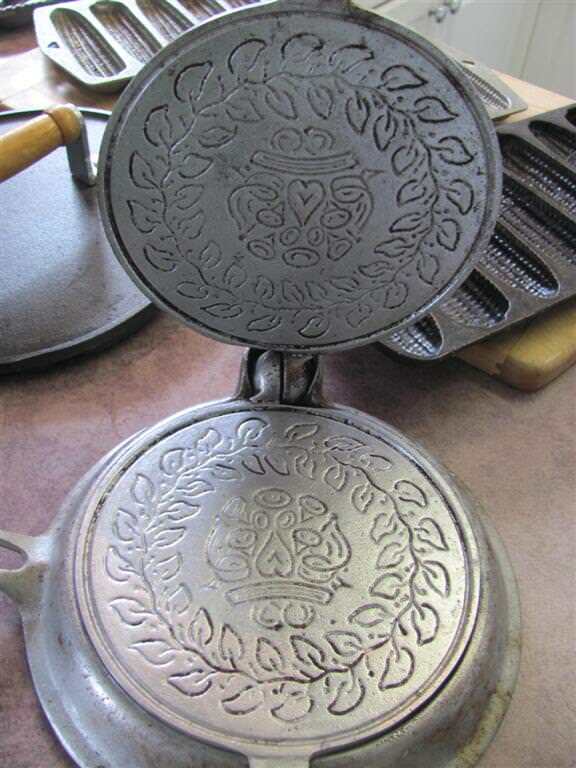 It said on the sticker that it was pre-seasoned, but I remember my dad saying they still needed to be seasoned and I recalled something about coating it in vegetable oil and baking it. I brought it home and I still had a frying pan with bacon grease in it from that morning, so I coated the pan with that and stuck in my oven at 350 for a couple of hours. Smoked like crazy and coated it pretty well. Decided to check the internet for tips and the first page said you had to do the coating and oven thing 2-3 times. So today, I didn't have any more bacon grease but I did have coconut oil, so I coated it with that and stuck it back in the oven. Just talked to my dad and he said to forget the bacon grease and the oven. He said just put some coconut oil in it, put it on the stove top and get it really good and hot, then let it cool down and wipe it thoroughly with a paper towel while it's still warm and that should be fine. I do it in the charcoal grill out doors. Coat the pan liberally with Crisco shortening inside and same with the lid if you have one. get a good charcoal fire going and set over it close. close lid and walk away net cook till fire goes out and its cool. Wipe clean out and you should be done other than the fine tuning cooking in it provides. 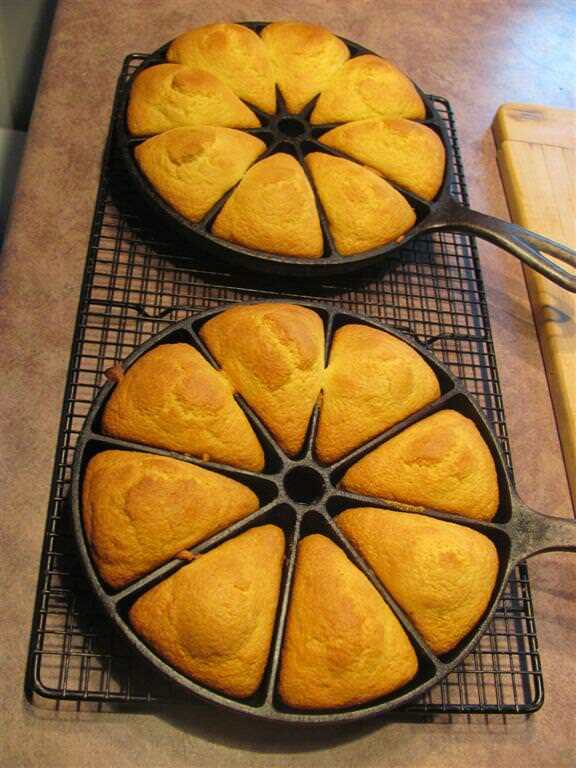 Mom used to do it with rendered lard on the stove top really heating it up to open the pores and work the liquid lard in. Was smokey and would set smoke alarms off. The world if full of seasoning techniques. This is how I do it. Turn oven on a low heat and warm pan to about 250 degrees. Remove pan from oven with cooking glove and with a paper towel wipe a lite coat of Crisco or Lard over the entire pan. Then wipe the pan Completely Dry! Place pan in oven up side down so as no oil could pool. Turn oven to 500 degrees when the oven hits 500 turn oven off and let pan cool in oven. When cool you are ready to start cooking. Repeat for a little better season. Do It when the wife is going to be gone fore a while. It's going to smoke a little. Cleaning is easy. If you do have a little food stuck in pan after cooking. Pour about 3/4 inch of water in to a room temp pan. 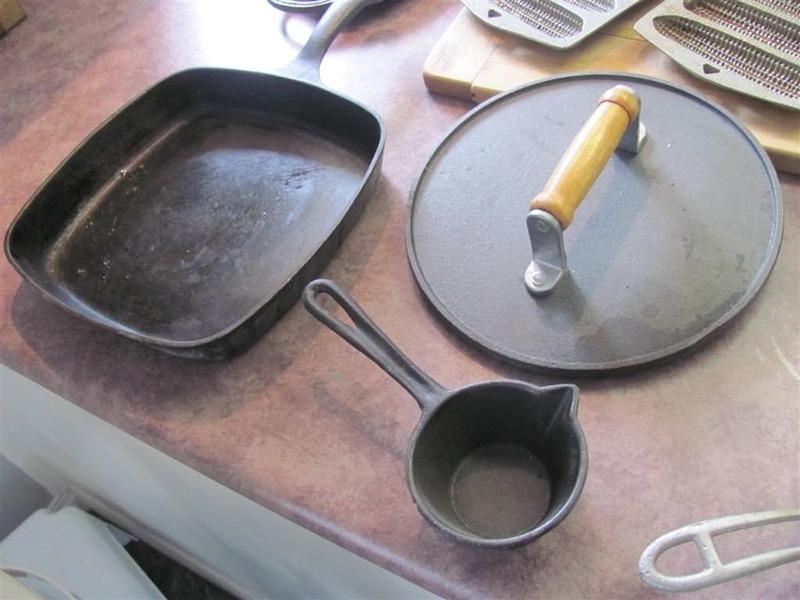 Turn stove burner on and heat water (without soap) while scraping pan with a flat wooden or plastic scraper. I'm done before the water hits a boil. Dump out and dry completely. Your ready for the next meal. Well, the sucker should be seasoned now! We're having a heck of a storm front move through so unable to use the charcoal grill with 40+mph wind gusts and heavy rain and sleet. Finished baking in the oven with coconut oil for the second time and then put it on the stove top and heated it up to the point I was worried that the oil was going to ignite. Had kitchen windows open to let all the smoke vent out and with the storm, it was quite a scene in the kitchen, LOL. So for cooking and clean up, just use warm water and no soap or green pad? Where every day is Caturday. Use whatever it takes to clean it up. The first couple times I use any new cast iron a little soap and a scrubbuing always seems required even after a couple seasonings. Sometimes if there's something stubborn stuck in the bottom I'll put half an inch of water in the pan and let it come to a boil, let it cool down, and scrub again. It will eventually get jet black and slick as teflon as you use it. It's only hubris if I'm wrong. 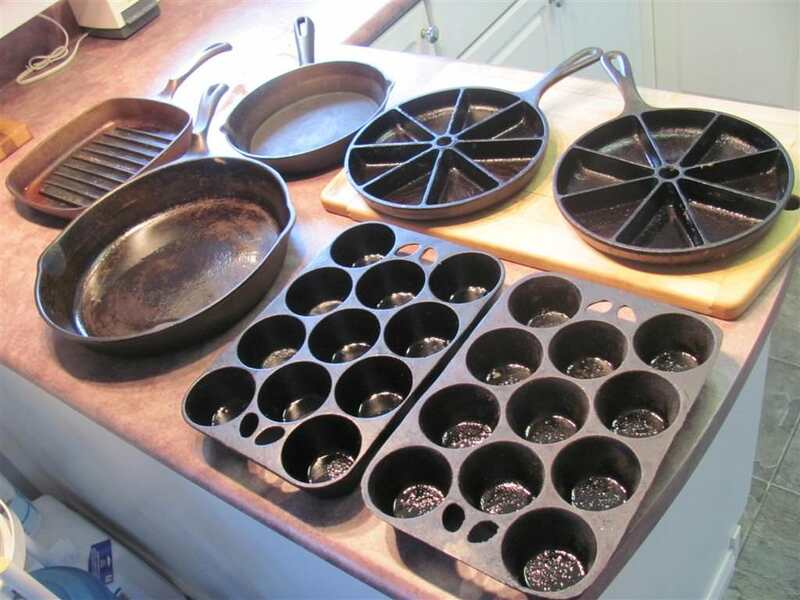 PS: Those cast iron muffin pans make the BEST Yorkshire Puddings that you'll ever taste! here is to good cooking ! When you get an old skillet crusted over with a heavy layer of carbon it is easy to remove. You need a hardwood fire about 4 feet across and the hot charcoals should be about 6" deep in the center. Use a hoe to dig a shallow crater in the center of the charcoals. Toss in the skillet and bury it with hot coals. Retire for the day and let the fire burn itself out. 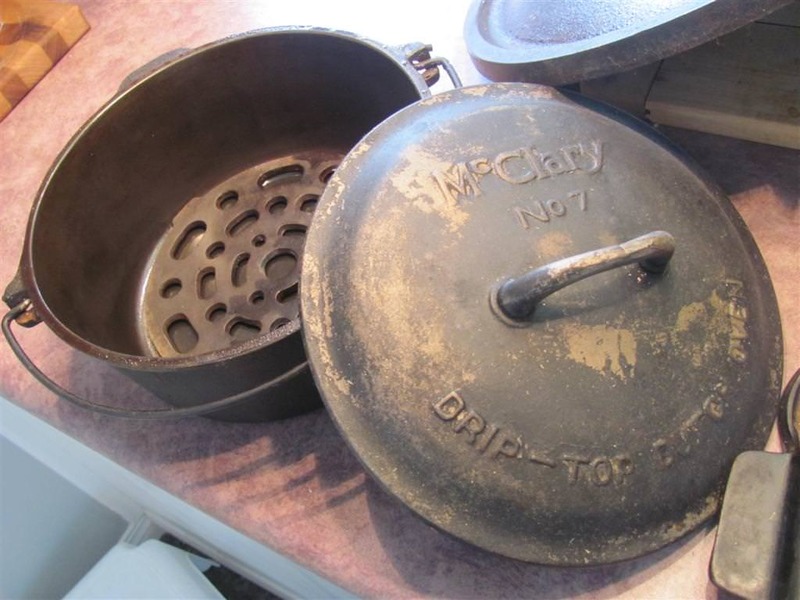 Retrieve your gray and new appearing skillet in the morning. It will appear fresh cast. Wash with clean water and reseason as necessary. Cast iron cookware is a normal way of life where I live. We even have a Lodge outlet about a 40 minute drive away. When I go through their store I am always amazed at the variety of cookware they offer. Have you replaced the Coleman stove yet? A friend is the manager of the local metal recycle yard. Anything in the yard can be purchased. When they get a Coleman stove in, I get a phone call. I now have 21 of them. Price around $3.00 ea. I have come to believe honey bees are more important to this world than I am. My mostes favorite thing to find at garage sales are cast iron stuff. Got two small Grisswolds at a garage sale right next to my buddy's house last summer. He was out cruising for Griswolds and didn't stop there. Heh heh!! DO NOT EVER put a valued cast iron anything in HOT COALS! The temps in those coals are well over 1,200F and will RUIN the iron in the pan. The iron will be heat damaged, the molecular structure of the iron WILL CHANGE, the pan can become warped, and may never take seasoning again. For seasoning, you need to understand what seasoning really is. Seasoning is a coating of hard polymerized carbons and plastics created by the heating of oils and fats above their smoke point. Yes, it's basically a hard plastic layer that is VERY thin which forms the more or less non stick cooking surface. That also prevents rust. To season iron, you need to wipe on oils or fats, in a THIN layer. Thicker layers will only cause it to puddle and to make a mottled appearance on the surface that is annoying but will eventually blend in. Wipe on the oil, wipe as much of it off as you can, and heat the pan ABOVE the smoke point of the fat used, this usually requires 450F but not over 500F. Temps over 500F will break down the seasoning and begin to cook it off. I put a pan with a thin coating of oil on it in a 450F oven for 30mins, using gloves and a blue Scott Shop Towel (no lint) I remove the pan and while it is hot, wipe it all over with a thin layer of oil and return it to the hot oven. I do this 5-6 times, and in an afternoon, I have a good layer of seasoning started. It will improve with daily use. When I get a new Lodge, I just rinse it out with hot soapy water, oil it and use it. I don't strip or season over the factory seasoning, it's the same as you could do with it, and they use canola oil. No green pad, that is scotchbrite, an abrasive, it will sand off the seasoning. I use a single paper towel most of the time and that's often all that's needed. A hard plastic spatula to scrape it when necessary, use about 1/8" of warm water and turn the burner on, scrape the pan with the plastic spatula, wipe clean and dry with a paper towel. sometimes I use a stainless steel scrubbee, and light pressure. Seasoned iron can be washed occasionally with soapy water, if you can't cook the seasoning off of the iron, what makes you think soapy water is going to remove it? This is a myth often repeated by those who only heard it from someone else.. The WAGS, (Wagner And Griswold Society) strictly adhere to non-abrasive methods of cleaning. They do not approve of nor do they promote the use of any type of blasting media, wire wheels, sandpaper, fire, they even frown on a self cleaning oven for removing old crud. Acceptable methods are: Soak in a lye bath, coat the iron with yellow top EZ OFF oven cleaner and stick in a garbage bag, electrolysis tank, vinegar and water (only for short periods of time as this can cause pitting). If you use a commercial cleaner, the preferred cleaner is Barkeeper's Friend, commonly called BKF in the cast iron circles. It is not abrasive, but forms a slurry of Oxalic Acid when mixed with water and it works very well on cast iron. I have used a water only 2600# pressure washer on tough to remove parts like letters and logos, this is not blasting, it's not abrasive, it does exactly NOTHING to change the patina of the iron on the surface. This change of the surface is what the collectors frown on the most. Any kind of physical contact with tooling or blasting will change the look of the surface. I have a ton of old Erie, Wagner, Lodge, Griswold, Sidney, Wapak, National, Vollrath, Favorite, and i have some newer Lodge. I like and use them all. Last edited by DougGuy; 04-07-2018 at 08:29 PM. Nah doesn't hurt a thing. It is no different than the heat of casting the skillet. Where did you ever get such a notion? You don't think old timers believed that do you? You might have some cheap iron that warped but my grandmother never did. That included 2 cast iron cauldrons used to boil water for scalding hogs when slaughtered. My grandmother was born in 1908 and knew more about cooking than any one I ever met. Acceptable methods are: Soak in a lye bath, coat the iron with yellow top EZ OFF oven cleaner and stick in a garbage bag, electrolysis tank, vinegar and water (only for short periods of time as this can cause pitting). The preferred cleaner is Barkeeper's Friend, commonly called BKF in the cast iron circles. I have used a water only 2600# pressure washer on tough to remove parts like letters and logos, this is not blasting, it's not abrasive, it does exactly NOTHING to change the patina of the iron on the surface. This change of the surface is what the collectors frown on the most. Any kind of physical contact with tooling or blasting will change the look of the surface. 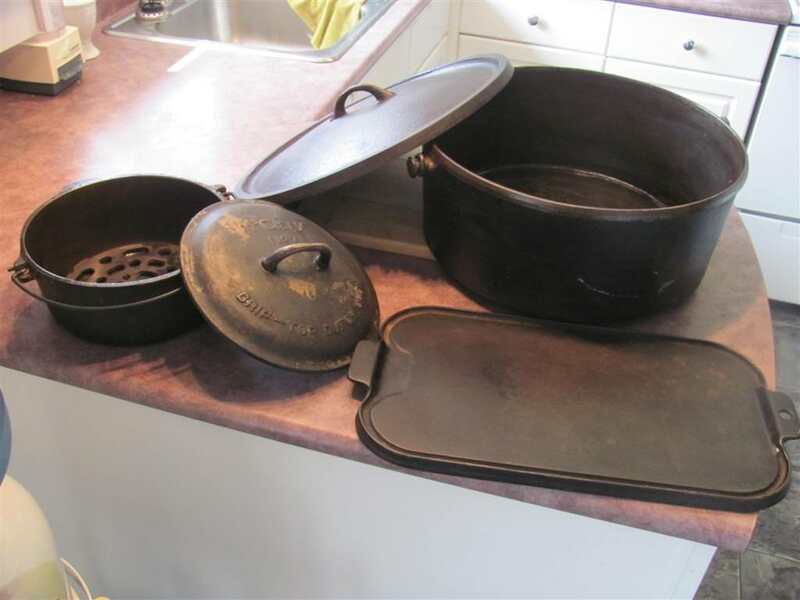 I have a ton of old Erie, Wagner, Lodge, Griswold, Sidney, Wapak, National, Vollrath, Favorite, and i have some newer Lodge. I like and use them all. Last edited by EDG; 04-07-2018 at 08:36 PM. It not only can but DOES hurt the iron. I have seen a lot of reddish hued iron that was heat damaged and the damage is permanent. When a skillet is cast, it is in a mold that is void of oxygen once the iron fills it up. In coals, there is no protective layer like the mold, and oxidation WILL occur. This oxidation is what ruins the metal. My dad and I had dinner tonight and he said he has a couple of old Coleman stoves from the 70's I could have, so I should be good to go. Thanks! Yes, you can over heat a dutch oven. Many of the very best dutch oven cooks in the world are right here in southern Idaho, northern Utah & you can get in a cooking competition every weekend somewhere if you want. Many, many of them use soap at times, most times we just warm up some water, wipe out the oven, let it cool down & give it a light oiling all over, both lid & oven. Doug I think you and I went to the same cast iron University. Frying some non-acidic food with oil/butter/bacon grease is how us old bachelors season cast Iron. Griswold is my personal favorite...I have two 9" frypans, and I rotate between them. It's a rare day when I wash them in hot water (no soap). When done cooking, I just scrap any crud off with a slightly flexible steel spatula, just like a fry cook does to the grill at the Cafe'. 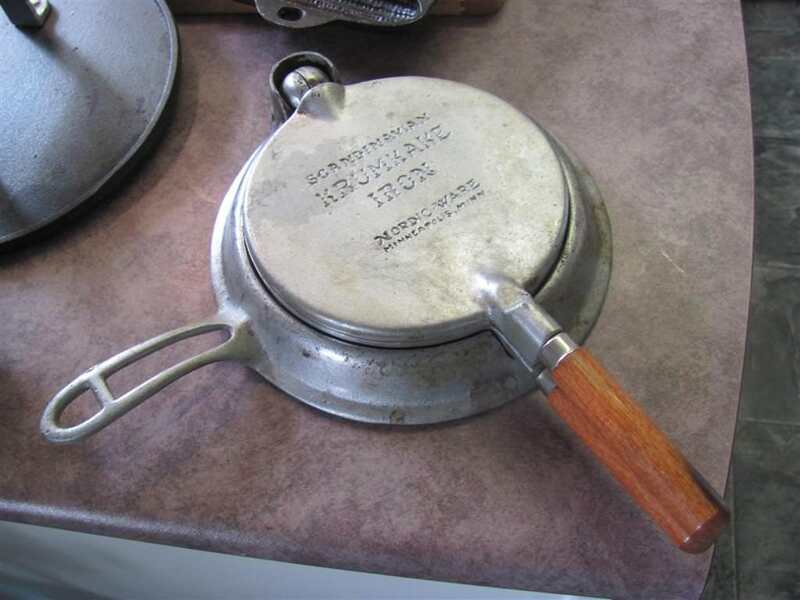 Don't over think this cast iron cookware seasoning thing, it's so easy, an old bachelor can do it...because you don't really do anything, just don't cook tomato type sauces (or other acidic foods) in cast Iron, bring out the stainless steel pans for that. Aluminum was mentioned...I threw that junk out years ago.